The soprano, Katja Popova, was born in Pleven on 21 January 1924. After studies at the Conservatory of Sofia with Mara Marinova-Cibulka, Katja Spiridonova and Asen Dimitrov, she graduated with highest honors. Immediately employed by the Sofia National Opera, she debuted in 1947 as Esmeralda in The Bartered Bride. In 1964, after winning first prize at the Youth Festival in Budapest, Katja Popova went on to win the first prize in the Singing Competition in Prague. International appearances took the soprano to Germany and France. 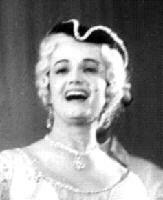 In 1959 she sang the role of Marguerite in Faust at both the Paris Grand Opéra and at the Vienna State Opera. In 1962 after repeating the same role in Brussels, she appeared in Russia and Czechoslovakia. Also known as an important concert singer, she was awarded the Dimitrov Prize, the highest of the Bulgarian awards. Tragically, Katja Popova, died at the peak of her career in 1966 in an airplane crash in Bratislava.